all gender and age groups participated in two separate 3.2 and 2 kilometres mini marathons, which were the last event of the First International PACES Competition 2016 that concluded here on Sunday. foreign armies in the races. started from the Askari 10 and ended at the Ayub Stadium Cantt. Most of the participants were youngsters and middle aged men. Saturday night. “Marathon is always a fun race and I wanted to enjoy it to the fullest,” he said. One athlete ran barefooted. “I feel easy that way,” he asserted. However, Professor Mohammed Rafiq was the oldest runner in that category. 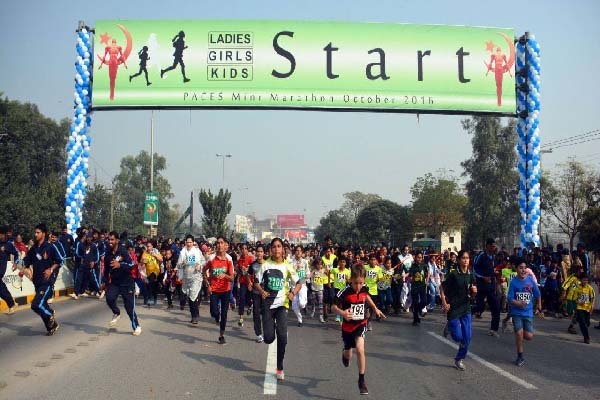 They ran for a two kilometres race that started from the Lahore Garrison Golf & Country Club and ended at the Ayub Stadium. Eight years old kid Toheed was the youngest runner of the race, who thought: “I am a tortoise running amongst the hares. Slow and steady wins the Race,” he affirmed. There was presence of a large number of zealous Lahorites, who turned up in thousands to show solidarity with the Pakistan Army and to pay homage to the visitors, who passionately participated in the 6 day competition and the mini marathon, rejecting false claims that Pakistan was unsafe for international sports. They lined up along the 3.2 kilometres race route to cheer and encourage the runners waving flags and raising slogans. bottles were available for the runners. Several people offered water bottles to the runners. Lt General Qamar Javed Bajwa was the chief guest, who distributed prizes among the winners. Boys 12 18: Maroof Younis (Ist), Farrukh Bashir (2nd), Nadeem Abbas (3rd). Gents 18+: Sohail Ahmed (Ist), Tariq Mehmood (2nd), Hari Kymar Rinal (3rd). Girls 12 18: Tehreem Alam (Ist), Javaria (2nd), Turab Zahra (3rd). Ladies 18 35: Farhat Bano (Ist), Rabia Ashiq (2nd), Samabia Noureen (3rd). Ladies over 35: Mrs Maqbool (Ist), Dr Fatima (2nd), Tahira Yasmeen (3rd).